Quite large selection of dash trim kits is offered for Buick owners. The variety comes from different modern colors and materials we use in manufacturing. Look at the webpage below and select among wood grain, real wood, camouflage, aluminum & carbon fiber patterns for Buick dash kits. We ensure premium quality you`ll enjoy. Buick Encore 2013, 2014, 2015, 2016, Full Interior Kit (Over OEM Trim), 36 Pcs. Buick Encore 2013, 2014, 2015, 2016, Basic Interior Kit, 26 Pcs. Buick Encore 2013, 2014, 2015, 2017, Exterior Kit, Full Interior Kit, 12 Pcs. Buick Encore 2013, 2014, 2015, 2017, Stainless Steel Pillar Posts, 8 Pcs. Buick Encore 2013, 2014, 2015, 2017, Basic Exterior Kit, 6 Pcs. Buick Encore 2013, 2014, 2015, 2017, Exterior Kit, Optional Fuel Door, 1 Pcs. Buick Allure /Lacrosse2005, 2006, 2007, 2008, 2009, Exterior Kit, Full Interior Kit, 17 Pcs. Buick Allure/Lacrosse 2005, 2006, 2007, 2008, 2009, Basic Exterior Kit, 8 Pcs. Buick Allure/Lacrosse 2005, 2006, 2007, 2008, 2009, Stainless Steel Pillar Posts, 4 Pcs. Buick Lacrosse 2010, 2011, 2012, 2013, Exterior Kit, 13 Pcs. Buick Lacrosse 2010, 2011, 2012, 2013, 2014, 2015, Stainless Steel Pillar Posts, 6 Pcs. Buick Lucerne 2006, 2007, 2008, 2009, 2010, 2011, Exterior Kit, Full Interior Kit, 15 Pcs. Buick Lucerne 2006, 2007, 2008, 2009, 2010, 2011, Stainless Steel Pillar Posts, 6 Pcs. Buick Lucerne 2006, 2007, 2008, 2009, 2010, 2011, Basic Exterior Kit, 6 Pcs. Buick Regal 2011, 2012, 2013, Deluxe Interior Kit (Without OEM Wood), 58 Pcs. Buick Regal 2011, 2012, 2013, Full Interior Kit (Without OEM Wood), 50 Pcs. Buick Regal 2011, 2012, 2013, Basic Interior Kit, 34 Pcs. Buick Regal 2011, 2012, 2013, 2014, 2015, 2016, 2017, Exterior Kit, Full Interior Kit, 17 Pcs. Buick Regal 2011, 2012, 2013, 2014, 2015, 2016, 2017, Stainless Steel Pillar Posts, 6 Pcs. Buick Regal 2011, 2012, 2013, 2014, 2015, 2016, 2017, Basic Exterior Kit, 6 Pcs. Buick Century 1997, 1998, 1999, 2000, 2001, 2002, 2003, 2004, 2005 / Regal 1997-2004, Stainless Steel Pillar Posts, 6 Pcs. Buick Century 1997, 1998, 1999, 2000, 2001, 2002, 2003, 2004, 2005, Buick Regal 1997-2004, Exterior Kit, 6 Pcs. Buick Regal 2011, 2012, 2013, Optional Overhead Console Interior Kit With Sunroof (With Homelink), 9 Pcs. 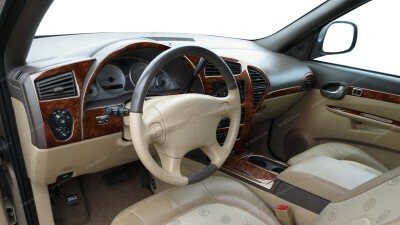 Buick Regal 2011, 2012, 2013, Optional Overhead Console Interior Kit Without Sunroof (Without Homelink), 5 Pcs. Buick Rendezvous 2004, 2005, 2006, 2007, Full Interior Kit, With Door Panels (Arm Rest), 31 Pcs. Buick Rendezvous 2002-2003, Full Interior Kit, With Door Panels (Arm Rest), 31 Pcs. Buick Rendezvous 2004, 2005, 2006, 2007, Full Interior Kit, Without Door Panels (Arm Rest), 27 Pcs. Buick Rendezvous 2002-2003, Full Interior Kit, Without Door Panels (Arm Rest), 27 Pcs. Buick Rendezvous 2004, 2005, 2006, 2007, Basic Interior Kit, 20 Pcs. Buick Rendezvous 2002-2003, Basic Interior Kit, 20 Pcs. Buick Rendezvous 2002, 2003, 2004, 2005, 2006, 2007, Exterior Kit, 6 Pcs. Buick Rendevous 2002, 2003, 2004, 2005, 2006, 2007, Stainless Steel Pillar Posts, 4 Pcs. Buick Terraza 2005, 2006, 2007, 2008, 2009, Chevrolet uplander 2005-2009, Pontiac Montana SV6 2005-2009, Saturn Relay 2005-2009, Full Interior Kit, 40 Pcs. Buick Terraza 2005, 2006, 2007, 2008, 2009, Chevrolet uplander 2005-2009, Pontiac Montana SV6 2005-2009, Saturn Relay 2005-2009, Optional Overhead Console Interior Kit (Console With 2 Door), 13 Pcs. Buick Terraza 2005, 2006, 2007, 2008, 2009, Chevrolet uplander 2005-2009, Pontiac Montana SV6 2005-2009, Saturn Relay 2005-2009, Basic Interior Kit, 24 Pcs. Buick Terraza 2005, 2006, 2007, 2008, 2009, Chevrolet uplander 2005-2009, Pontiac Montana SV6 2005-2009, Saturn Relay 2005-2009, Optional Front Cupholder Console Interior Kit, 3 Pcs. Buick Terraza 2005, 2006, 2007, 2008, 2009, Chevrolet uplander 2005-2009, Pontiac Montana SV6 2005-2009, Saturn Relay 2005-2009, Optional Rear Cupholder Console Interior Kit, 3 Pcs. Buick Terraza 2005, 2006, 2007, 2008, 2009, Interior Dash Kit, Optional Door Sills, 4 Pcs.